“Resenting the Rich Is One of the Surest Ways to Stay Broke” | Nicholas Hoffman & Co. The source of the above quote (a Canadian called T. Harv Eker) would generally not be my “go to” person for life advice but I think he might have a point. The last 60 years or so has demonstrated that economies designed to manage the wealth and income of individuals do not work. At the same time the spread of systems which facilitate reward for productive work and initiative has made an unprecedented positive impact on the quality of life across most of the globe (sorry North Korea). At the individual level within our nation the mind-boggling disparities in wealth between the richest and the poorest should not obscure the fact that the expected basic standard of living is way higher than in the past. Even the recent “lost years” for wage growth occurred at a time when the technology affordable for the everyday person significantly enriched our options for personal communication and the use of discretionary time. Nobody was talking about monitoring screen time twenty years ago. Of course, the rich continue to be a fascinating topic. They are good group to bash if you are a populist politician. They make for seductive subject matter if you want to sell content in the media. Most of all they are always going to attract envy, with the occasional dash of admiration thrown in. The recent $238 million purchase of an apartment by billionaire hedge fund manager, Ken Griffin, is a case in point (incidentally he was apparently just looking for a place to stay whenever he happens to be in Manhattan). This story merited two articles in the Wall Street Journal. The oddest thing about this fascination for me is that rich people are just people after all. Any “differentiators” come down to attitudes and how they use their time. According to Eker, key characteristics of rich people include choosing to be in control of their success, thinking big, committing to attaining wealth, playing to win, and not being derailed by problems. There are other writers on this topic that will add the behaviors of hard work, being highly focused, and adopting a thrifty lifestyle (especially during the accumulation phase). We tend to spend too much time expending negative energy in reaction to seeing that others have more than us. Moreover, we differentiate between the good wealthy (typically entertainers and athletes) and the bad wealthy (which obviously includes anyone with finance or bank included in their resume). The good wealthy category is particularly strange, but maybe it comes from a direct appreciation that an athlete is doing something that we know we cannot do. There is no such assessment of an investment banker who is presumed to have raked in his or her money with scarce an ounce of skill or effort. So, I am happy to propose a toast to the rich. May they live long and prosper, and may the category of the wealthy be joined by many new people in the future. 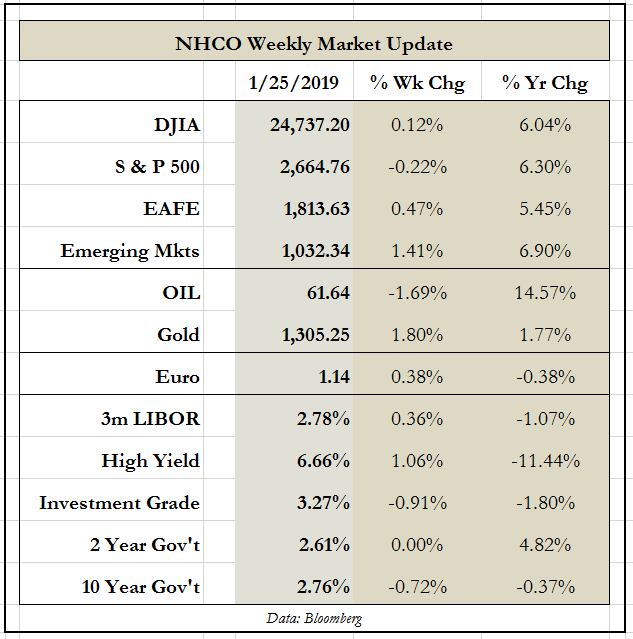 This entry was posted in The Weekly on January 28, 2019 by nhoffmanandco.